Join clinical psychologist Rachel Cohen, the founder and executive director of Common Threads, an organization that works with women in post-conflict and refugee situations to help them recover from the psychological consequences of sexual and gender-based violence. Common Threads provides a space for women to sew their stories onto cloth as a way of making their journey towards greater personal empowerment. Presented by Eugene Lang College for the Arts and The New School for Social Reseach. As a result, we believe it is necessary to expand our focus to include how attention to individual well-being may be contextualized in efforts to promote a more just and equitable society. 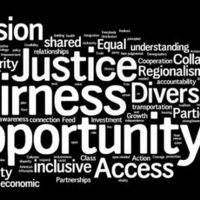 Our aims, ultimately, are dual and reciprocal: 1) to conceptualize ways in which to incorporate a social justice lens on both a micro level with clients, and also a macro level with advocacy work, and 2) to understand how injustices in a variety of spheres (criminal justice, housing, etc.) affect the well-being of individuals, particularly for those who are disproportionately likely to be oppressed by these systems and who have access to fewer resources. With this in mind, we have spent several months questioning what a social justice-oriented clinical psychology program might look like. This is just one of the many questions that has framed our “action plan,” an eight-week program of events at the New School, including films, lunchtime talks and readings that cover a range of issues from white supremacy to reproductive justice. Our focus includes both consciousness-raising initiatives, and exercises to explore how our work could be utilized to speak to the lived experiences of the diverse communities we intend to serve. Although our action plan is just a small step towards answering these questions, we hope it will be of use not just to our fellow students at the New School, but also to others, in clinical psychology programs elsewhere.